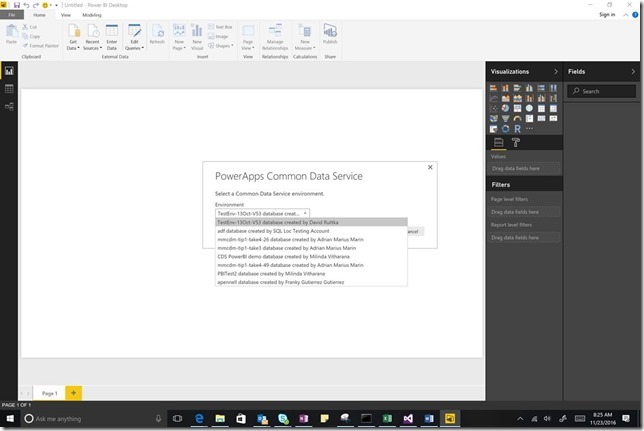 Today we are pleased to announce the availability of Power Apps Common Data Service (CDS) connector to Power BI desktop as a preview. You can now create rich reports with the data in CDS using Power BI desktop, the authoring tool for Power BI. Using the full power of Power BI, you can then go on to create and share stunning dashboards with users in your organization. We have worked very closely with Power BI team to develop this connector. 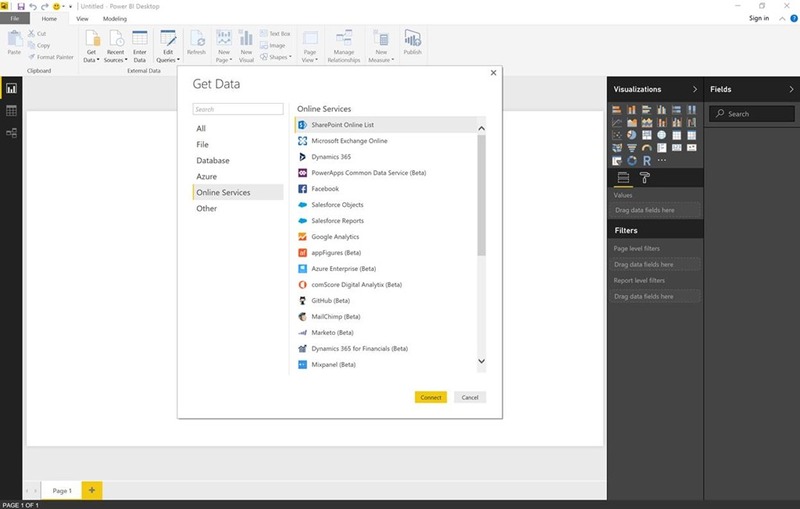 If you have downloaded the February update of Power BI desktop, you already have access to the connector. 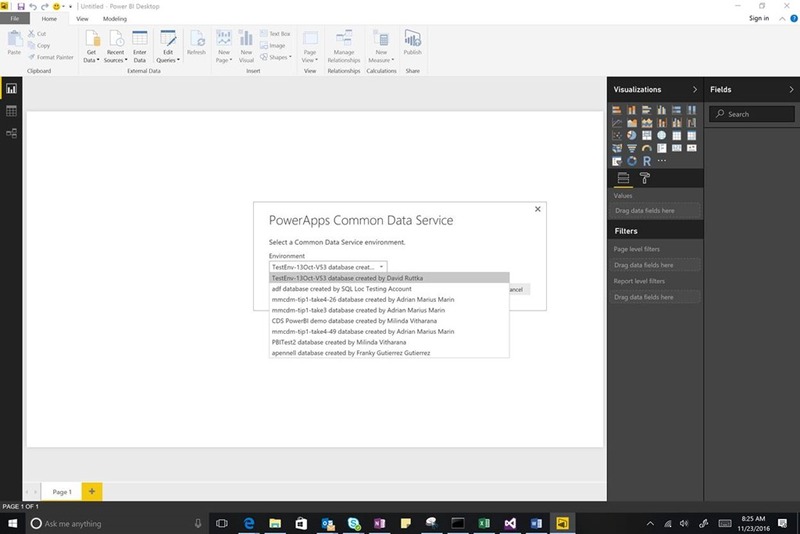 Power BI is intimately aware of PowerApps and CDS. The PowerApps CDS connector enables you to leverage key features built into CDS and PowerApps in Power BI. Important: This feature was available initially as preview to selected customers (or databases, more accurately) based in USA. The preview is now closed. Further details will be provided soon. There’s no need to schedule a refresh in Power BI. When the data is updated in CDS, changes are reflected in reports. Reports are interactive and responsive. 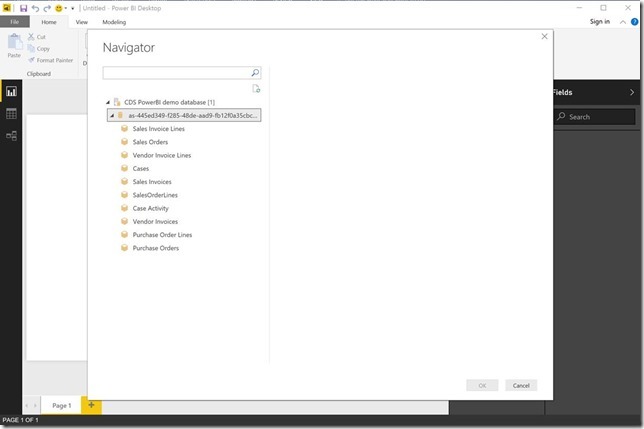 You can interactively explore CDS data using the capabilities of Power BI. When you secure CDS entities using policies for a set of users, the same permissions are applied to Power BI reports. As an author writing Power BI reports, you can only report against the entities to which you have been granted access in CDS. As an author, when you share reports with your peers in PowerBI.com, your peers can only see the data they are allowed to access in CDS. You do not need to secure data explicitly within Power BI. CDS enables makers to define rich data types such as Address, Boolean, and Currency when you add fields to an entity. In addition to rich types, makers can also define a list of values, called picklists. These types are recognized by Power BI as first class data types. For an example, when you report using an address field, Power BI shows a map as a default visualization. While CDS contains a rich set of entities representing many business areas, as a Report writer, you may be interested in creating reports by focusing on a business question or a subject area. To make it easier to report on a given business question or a subject area, we have organized entities into a set of ready-made subject areas called Perspectives. A perspective offers a “view into data” from a reporting point of view. At the time of launch, we have categorized the entities in to 10 perspectives as follows. Are our Sales Orders coming from a specific customer segment or a region? Are we offering larger than usual Discounts to specific accounts or products? We buy a lot! – are we getting good discounts from our vendors ? What are the most common cases and where do they originate from? *You may notice that we have renamed some of the Entities within perspectives to provide better context for business questions. 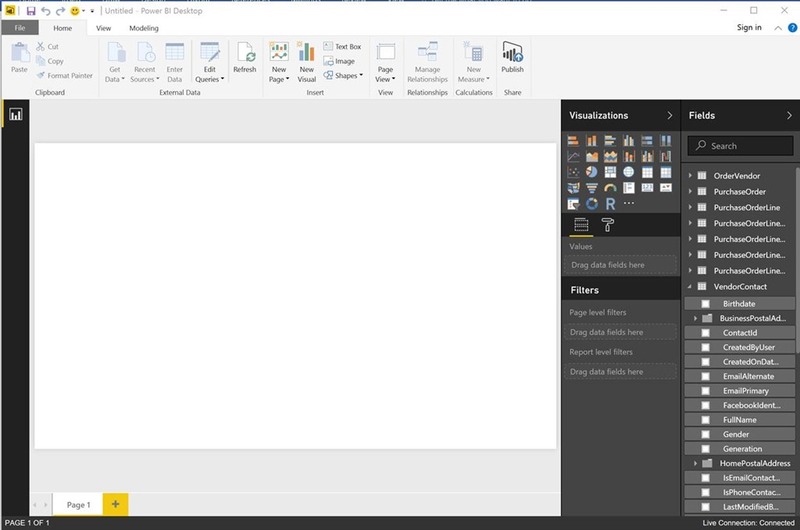 When you extend the ready-made entities by adding fields, they will be reflected in Power BI desktop under the respective perspective (no pun intended) and you can use them in reports right away. As we add more ready-made entities into CDS, we will introduce more perspectives that answer valuable business questions. Soon, we will also enable you to define your own perspectives or, extend ready-made perspectives by adding your own entities. So how do you start reporting with Power BI? 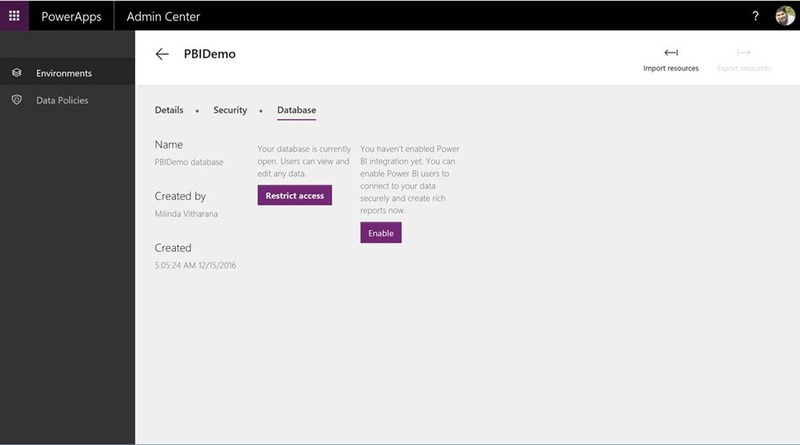 – during preview, you would need to enable Power BI integration feature using the admin portal in PowerApps (admin.PowerApps.com). If your CDS environment happens to be in a region where this feature is enabled, and if you have been selected for the preview, you will see an option to enable the feature. You need to enable the feature only once per database. Click the button to enable the feature and you are ready to go. Before they can start writing reports, they have to login to the PowerApps environment at least once to confirm that they are a maker. If you are already logged into Power BI desktop, you will be asked to choose an environment to report on. If not, system will ask you to login with your school or work (AAD) account. If you have access to multiple CDS environments, that is, you have been designated as a maker in more than one CDS environment, you need to select the environment you need to report on. Next you will be shown a list of Perspectives to report on. On choosing a perspective, you will be shown the list of Entities for reporting. You can publish the reports to PowerBI.com and share with your peers. These reports, along with the reports that you create in Power BI, can be can be shared with users in your organization using capabilities of Power BI. As a maker, you can create reports using CDS environments in Power BI desktop without requiring a Power BI license. 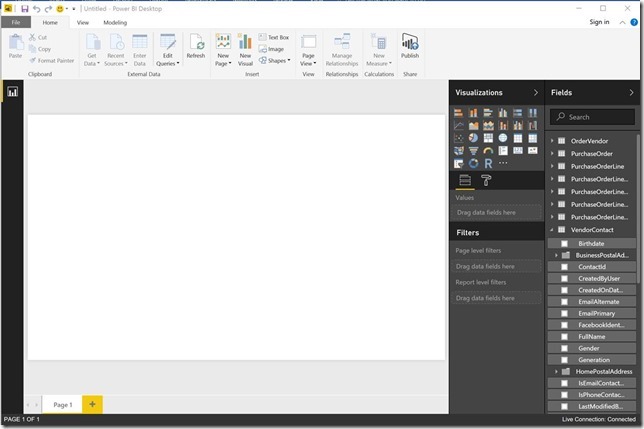 Makers can also publish their reports to PowerBI.com with a pro or a free license. Users who view reports built using the PowerApps CDS connector, will require Power BI pro license. 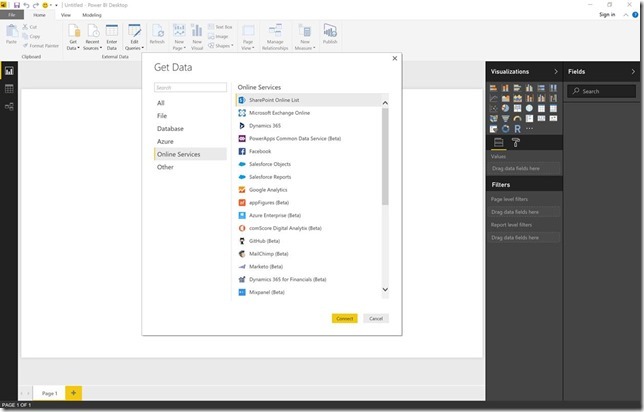 If you do not have a Power BI pro license, you can choose to go with a Power BI pro trial license and all the functionality will be available to you.